The Atlantic Bluefin Tuna is a highly valuable species in the Japanese sashimi market which has been overfished across its range. According to the IUCN as of 2010 there has been a decline of up to 51% over the past 39 years. This species is listed as Endangered because of its critical historical low levels due to overfishing. 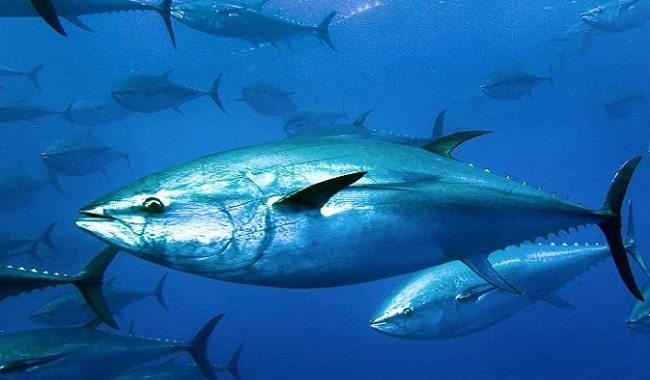 The International Commission for the Conservation of Atlantic Bluefin Tuna (ICCAT) was established in 1967 and establishes annual fishing quotas. This species live in subtropical and temperate waters of the Atlantic Ocean, the Mediterranean and Black Seas. Atlantic Bluefin Tuna was historically found in the Western Atlantic from Canada in the north to Brazil in the south, however the population in Brazil has disappeared and has not been observed in the last 36 years. It is also found in the Gulf of Mexico and the Caribbean. This Western Atlantic population spawns in the Gulf of Mexico from mid-April to early June at temperatures of 73 to 81.5ºF (22.6 to 27.5ºC). The Eastern Atlantic population of Atlantic Bluefin Tuna can be found from Norway in the north and as far south as northern West Africa. It is also present in the Black Sea and in the Mediterranean. The Eastern Atlantic stock spawns in the Mediterranean Sea from May to August at temperatures of 73 to 78ºF (22.5 to 25.5ºC). They can tolerate wide ranges of temperature and can be found near shore seasonally. 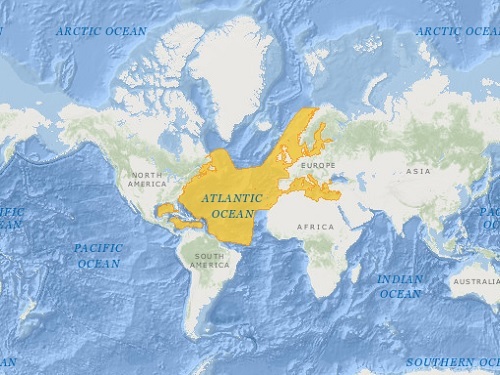 Atlantic Bluefin Tuna distribution. Map adapted from IUCN. Its average size is 6.5 feet (2 meters) but can grow up to 9.8 feet (3 meters) long. They weight 550 lb (250 kg) on average. The Atlantic Bluefin Tuna is a close relative of the Pacific Bluefin and the Southern Bluefin Tuna. For many years the Pacific and Atlantic species were considered the same species. Atlantic Bluefin tuna feeds on mackerel, herring, mullet, squid, shrimp and crabs. Tagging data shows that Atlantic Blue fin tuna cross the Atlantic several times in a year, some can cross it in 60 days. When it is not spawning season they congregate in the Atlantic to form feeding aggregations. The Western population of Atlantic blue fin tuna start to spawn at 8 to 10 years old when they are approximately 6.6 feet (2 meters) long and 320 lbs (145 kg). The Eastern population of Atlantic blue fin tuna start to spawn at 3 to 5 years old with a weight of 55 lbs (25 kg) and 3.9 feet (1.2 meters) long. Females lay up to 10 million eggs each spawning period while males fertilize the eggs. Hatching takes from 1.5 to 4 days. The Atlantic Bluefin tuna is expected to live from 35 to 50 years. Predators of Blue fin tuna includes sharks, orcas or killer whales and humans. Sports fishing for giant bluefin started more than one hundred years ago. The largest Atlantic blue fin tuna was caught off Nova Scotia, Canada and weighed 1,496 lb (679 kg). Then largest market for Atlantic Bluefin Tuna is Japan where it is highly valued as sashimi or sushi.